Jug Handle Arch is located along the Colorado River just off of Highway 279, the Potash Road, west of Moab, Utah. The arch is viewable from the roadway but a panel of petroglyphs on the face of the cliff near the arch are worthy of a closer inspection. 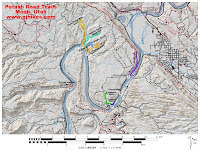 To get to Jug Handle Arch drive north on Highway 191 for about 4 miles from the center of Moab and turn left, west, onto Highway 279, the Potash Road. The turn off is a quarter mile or so before reaching the entrance to Arches National Park. 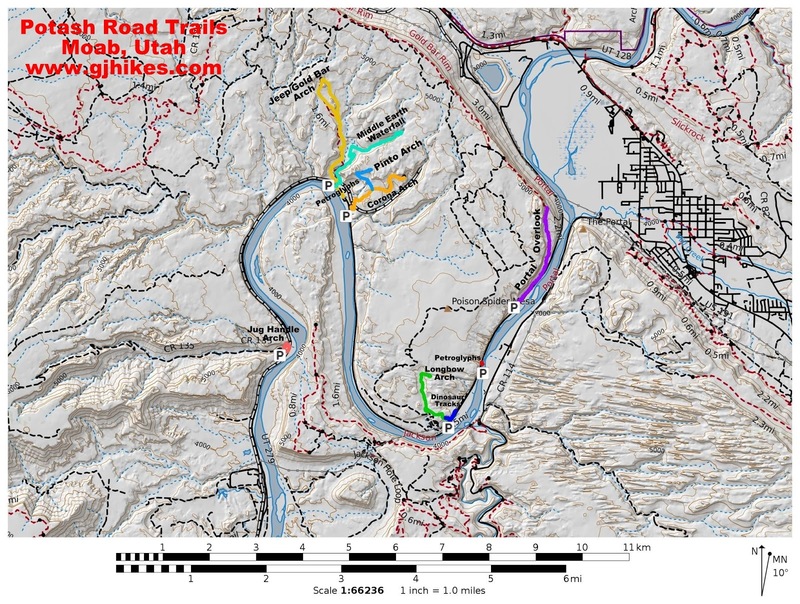 Follow the Potash Road for 14 miles to the Jug Handle parking area at the mouth of Long Canyon. For this post we hiked a little loop that began by walking along the railroad tracks. Once past the cottonwood tree there is a dyke from where the route up to the petroglyphs becomes evident. There isn't a marked trail to follow but there are enough tracks from other hikers to help with picking out a good route. 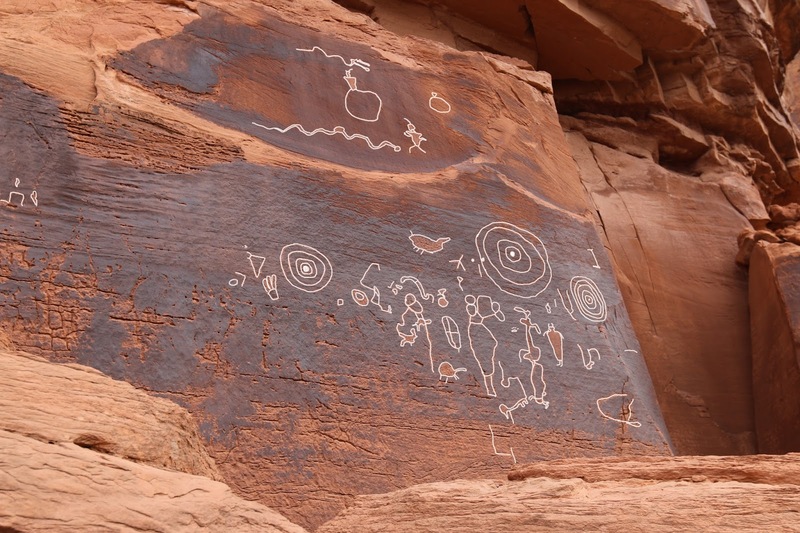 There are two panels of petroglyphs, one on top of the other. This one might be referring to the confluence of the two rivers located about midway between here and the current location of Hite. That or it could be a recipe for chocolate chip cookies. The lower panel is hard to fit in one picture when standing on the boulder directly in front of it. The concentric circles might be part of a solar calendar that takes advantage of the suns position and the arch. We took another photo from a lower spot on the cliff and highlighted some of the images on our computer to make them stand out. Taking pictures of Jug Handle Arch while standing close to it aren't much better than from a distance. The view up Long Canyon is rather pretty. Across the road there is a climbers access trail that is visible that leads up to the point of the cliff where there is a popular climbing route. You can also hike the trail around the front of the cliff that faces the Colorado River. It's not too bad of a short hike with some good views of the area along the Potash Road. 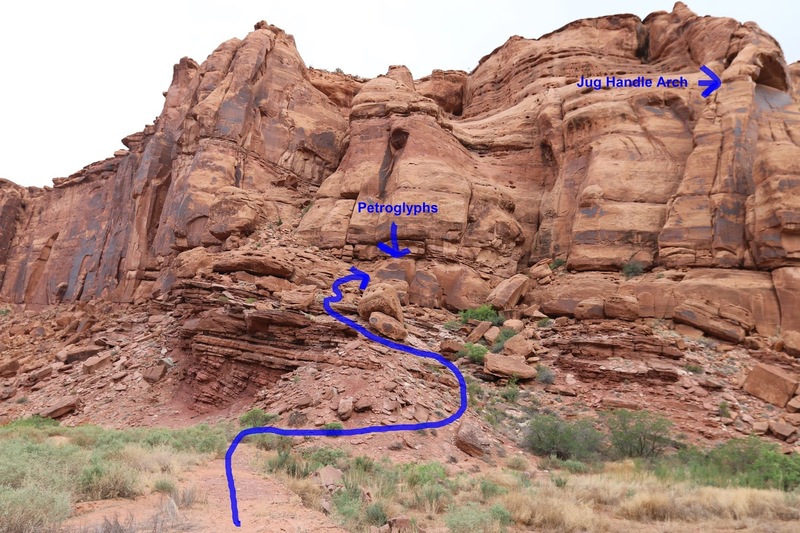 The wash makes a good trail to and from the arch and petroglyphs when it is dry, which it normally is. We weren't really planning on posting Jug Handle Arch until we saw the petroglyphs. They are interesting all by themselves and if they do take advantage of the light and shadows from the arch to create a calendar site then that makes them even more interesting. If you would like to see it for yourself then all you have to do is 'Take a hike'.